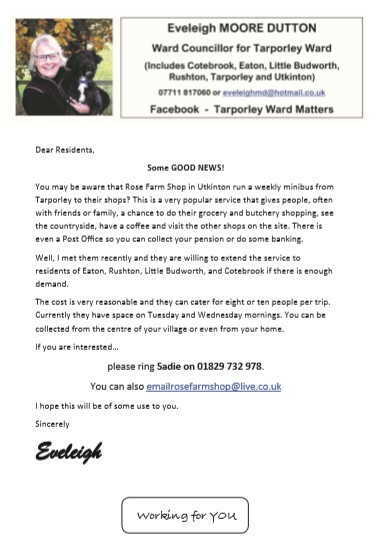 You may be aware that Rose Farm Shop in Utkinton run a weekly minibus from Tarporley to their shops? This is a very popular service that gives people, often with friends or family, a chance to do their grocery and butchery shopping, see the countryside, have a coﬀee and visit the other shops on the site. There is even a Post Oﬃce so you can collect your pension or do some banking. Well, I met them recently and they are willing to extend the service to residents of Eaton, Rushton, Little Budworth, and Cotebrook if there is enough demand. The cost is very reasonable and they can cater for eight or ten people per trip. Currently they have space on Tuesday and Wednesday mornings. You can be collected from the centre of your village or even from your home. I hope this will be of some use to you.